This Spyderco Manix 2 features tactical black G-10 scales, frame and pocket clip. 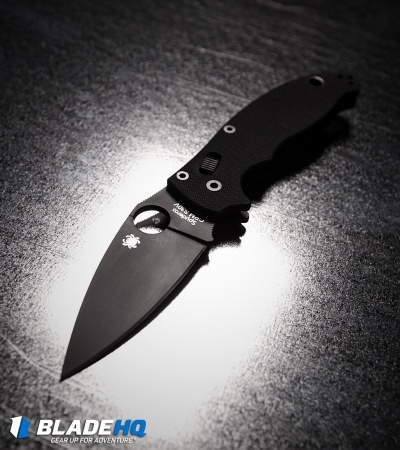 The full flat ground S30V steel blade is DLC finished with a plain edge. The recipe for success: Start with an exceptionally strong lock, manufactured using precise tolerances and add a blade honed from exotic high-carbon stainless steel. 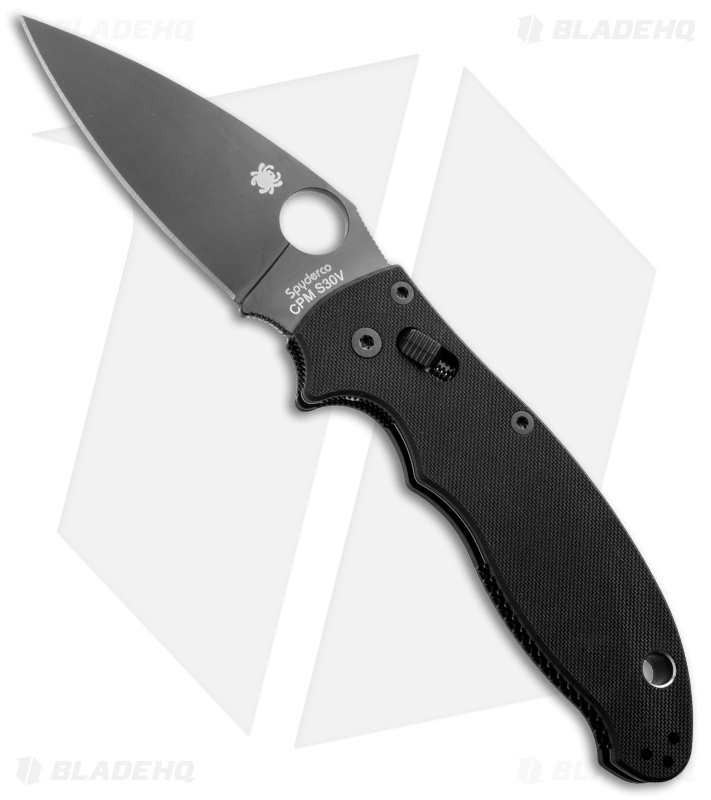 The conclusion is the Manix 2. This was my first “real” knife. After carrying box store Gerbers, S&W, and Case. I decided to invest in a higher end knife. After months of research and debate I decided on the Manix 2 S30V all black. I COULD NOT BE HAPPIER. This knife delivered on all fronts. It is absolutely beautifully made, the ergonomics make it feel like it was custom made for my hand. The blade was razor sharp out of the box. It does take a little breaking in which is great because I can’t seem to stop playing with it. I am a knife user and can’t wait to put this thing through the daily tasks. Have bought this knife more than once due to a friend loving the ergonomics and function. It works and feels great in hand. Just buy it. This knife has to be my number one at the moment, I love the paramilitary 2 but this knife just has a bit more weight and feels a bit sturdier in my hand, I unfortunately broke the tip of my first and had it profiled but missed the length so I bough it again! This knife is worth the price in my mind and has is just my go to at the moment. 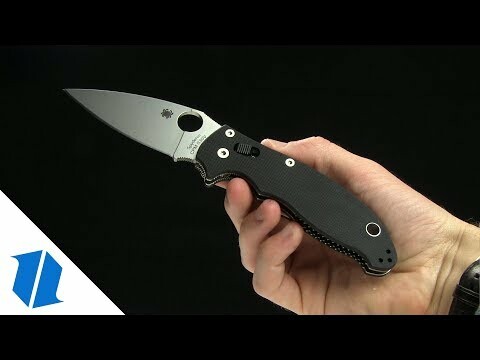 Can’t wait to for more from Spyderco! This is by far my most used knife and even though I own nicer and better looking knives when it comes down to it this is my favorite. Spyderco steel is always amazing no matter the type the heat treats are always perfect and with the manix you get a great sized blade with a great flat grind to make slicing even easier. The ergonomics are amazing and no matter how long I use it i never get a hot spot. Couldn't recommend this knife enough. Everyone should have one. I absolutely love this knife. The ball bearing lock gives a perfect closed retention and a solid lockup I trust. Im not a collector and didn't have much money to spend and did way too much research in buying one of my first quality knives. I have not regretted this purchase at all since the year ago I bought it. Fantastic knife. Solid, great at cutting and plenty ergonomic for a flat handled knife. The dlc is well done and the action is very smooth on the deployment. On the bad side theres the fact that the disengaging on the lock is a bit stiff and that it is quite wide when closed. I consider the Manix 2 the blue color work horse. It just wants to work all day long. All though it may not be my favorite knife if I only had to pick one it my be a Manix 2. If you have to carry a folder for every day use it doesn't get much better than this. I've had this knife for a few months and have been thoroughly impressed. A perfect companion for daily tasks. S30v holds a good edge for a long time and is easy enough to sharpen with minimal skills. 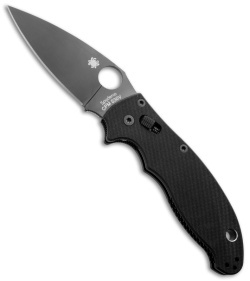 In a tough decision I chose the Manix 2 over a Paramilitary 2 as my first Spyderco knife. I’ve had it for over a year now and I’ve never regretted my decision to buy it. It’s big and grippy and fits perfectly in my hand. The ergonomics of this knife are absolutely stellar. The grip feels good right both when you’re up on the choil and in a further back grip using only the handle material. The gimping on this knife and is fantastic and plentiful. Most notably the spine and finger choil have great aggressive gimping that keeps the knife in your hand even during hard cutting tasks. The CBBL (Caged Ball Bearing Lock) is absolutely fantastic. It is a rock solid lockup every time. Pulling the cage back one handed takes a little time to learn the technique, and the spring is pretty stout, and need to be broken in a little. Some reviews I’ve seen have nocked the lock as having too strong a spring, detracting from its usability. As a hard use knife I really enjoy the strong spring and solid lockup, and I think it’s perfectly suited to the knife. 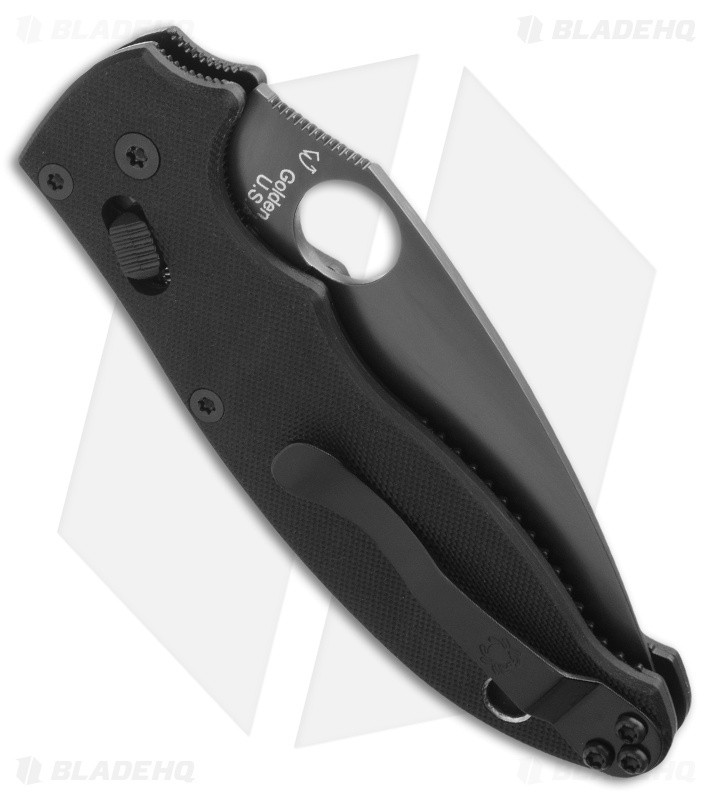 The lock also acts as a detent, so the knife will fly open when “spydie flicking” it open. Both thumb and middle finger flicks are options and are very satisfying. S30v is a very competent steel and I’ve found it to be perfect for this knife. The blade shape is wonderful, the full flat grind is great for slicing and the fine needle point is great for fine tasks (especially when being able to choke up on it). The black DLC coating has proven to be very resilient. It will take some stains and heavier cutting tasks can leave streaks on it. In my time using it (working full time last summer as a forester, and then as handyman and yard service) none of the coating has worn off, but it has become a little stained and has some steaks on it. As a hard use knife this does not bother me in the slightest. The build quality is fantastic. Zero blade play, handle and all components fit flush and snug, rock solid lockup. In my mind this is one of the best hard use-capable knives you can buy, I didn’t buy it originally for this purpose but it quickly filled the role. Buy it! I purchased a few less expensive and lighter duty Spyderco knives before buying this one. I was hoping for a heavy duty knife I’d love. This wasn’t it. I can’t complain about the fit and finish, it’s top notch and comfortable in hand but I have not been impressed with the action. After carrying and using for some time it never seemed to break in and just doesn’t deploy easy or fast, for me anyway. It’s a great knife, but I’m not impressed considering the price. Chose this as a size upgrade from my Benchmade mini barrage which is a great Edc blade that I still love, but I've not purchased another Benchmade, I have on the other hand added 2 additional Spyderco's to the collection. The fit and finish was fantastic, the s30v is far superior to benchmade's 154cm somewhat to be expected, it is heavy but in a good solid beefy way, smooth fast and mean and scary looking when it needs to be, but easy to hide if need be with the black blade... Great grip and ergos, nice jumping and plenty of it, great pocket clip, looks small from the outside, although it is a wide knife and it does take up some room in the pocket, and mine spent January 2015 to late April 2015 in a dirt Vermont parking lot plowed up into a snowbank and eventually dug out of the dirt by a friend who didn't know it was mine and finally returned when I spotted it in his pocket and could tell it was mine by markings I put in the g-10 for just such a situation. All blade staining came off super easy and with a tear down and cleaning she's back on top killing it... Buy one!!!! And BladeHQ is the best!!!!! I've EDC this knife for about 2 years and it is very robust. The S30v steal holds a great edge. The DLC coating is amazing, I've stabbed sheet metal, cut a small tree down (trunk was 3 inches in diameter), grazed and hit rocks and concrete while uprooting the said tree, and the finish does not have a single scratch. This is one of my most ab-usable, dependable, and affordable knives. And I've used and abused Striders, BM and Hinderers.